Canukkale (Cannakkale) and the relation between the Gallipoli peninsula and Istanbul. In World War I the Allied forces (Australian and New Zealand) attacked the peninsula in an attempt to open the way to the Black Sea and help the Russian, who were being pressed by the Turks.. 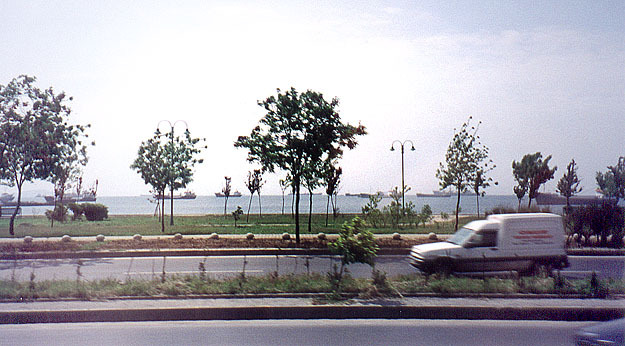 In order to catch the ferry Ahmet intended across the Dardanelles at 8:00, we had to get up very early. But we were getting accustomed to that! We did arrive more or less at the time he hoped we would, but the ferry was already full, and (along with several other tourist buses) we had to wait an hour for the next one. A small group of us (four Canadians and two Australians) took advantage of the hour to do a little exploring along the streets around the waterfront. 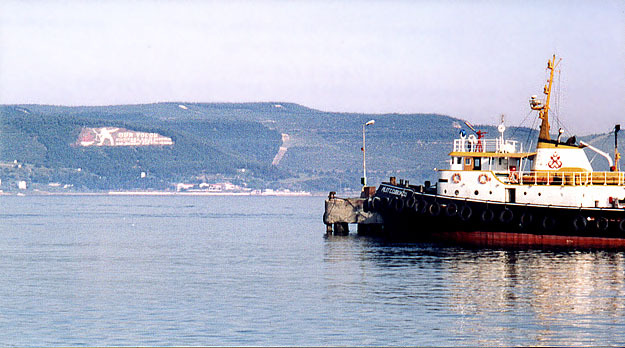 The Cannakkale waterfront, looking across the Dardanelles to Europe and the Gallipoli Peninsula. 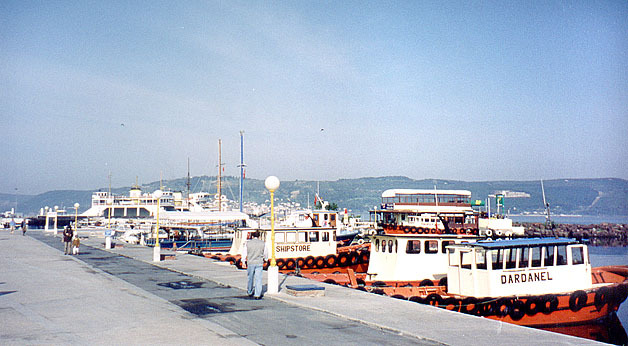 (Left) Fishing boats. In the background you can see a sign cut into the opposing hillside (Middle) A better view of the sign memorializing the Gallipoli battle of World War I. 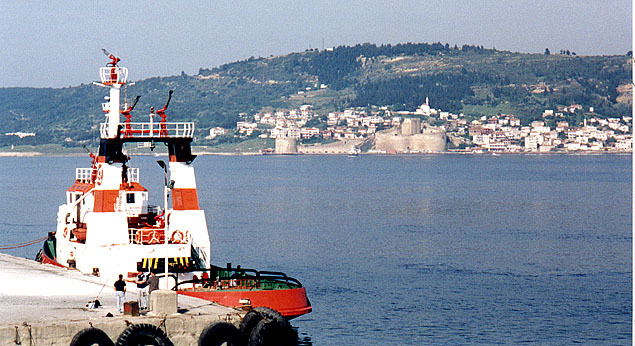 (Right) A Byzantine fortress guarding the entrance to the Sea of Marmara and the Black Sea. In Cannakkale. (Above) A fish seller, perhaps an auction of the catch? 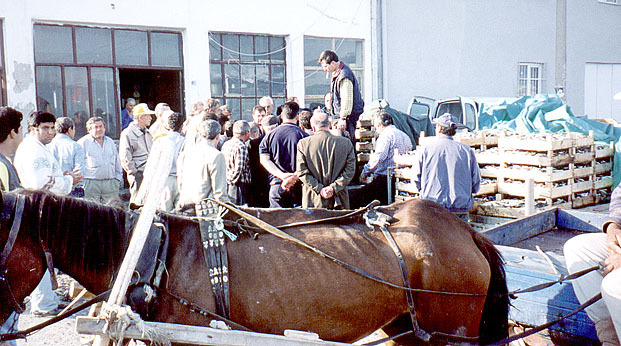 Note the ribs on the horse. We saw a lot of that in both Greece and Turkey. (Right) I wonder what the plant is like inside the house? One end of the Cannakkale waterfront is fairly toruisty, with a small park, some hotels and a wide esplanade for promenading. That is where the left picture above was taken from. 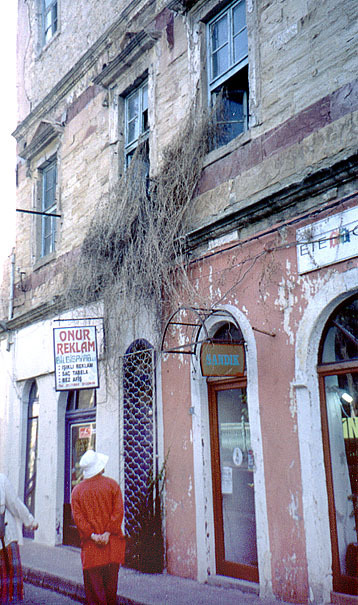 In the other direction, it is more commercial, and in the back streets a little run down, as the picture of the amazing vine growing out of the broken house window suggests. But a little further on, there is a maritime musem which has a replica of one of the minelayers that pretected the Dardanelles in World War I. We could not go in, though, because it was too early in the day and they were not open. When we were looking in the gate, a group of youths were there also, waiting for opening time. As with so many others, they wanted to practice their English, so we chatted for a short while before continuing our exploration of Cannakkale. 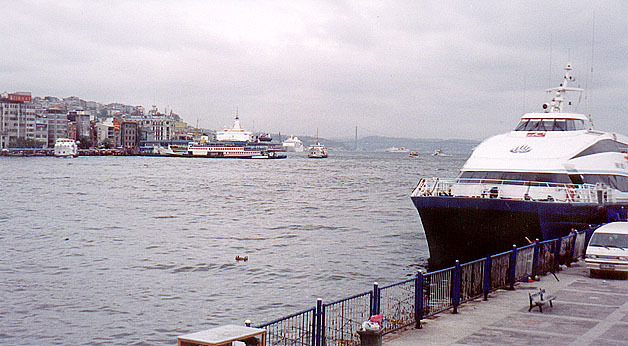 An hour later, the bus was allowed onto the ferry, but the loadmaster wanted to place the bus in a position where the view would not be very good, and Ahmet got very angry with him, until he allowed the bus into a better position. But most of us left the bus and went up to the higher places on the boat. We expected it to cross directly to the Byzantine fort, but it didn't. 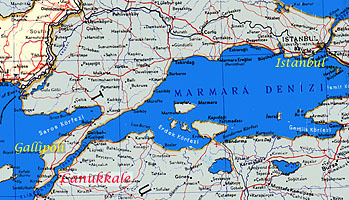 It went up the Dardanelles almost to the entrance of the Sea of Marmara before arriving in Europe on the neck of the Gallipoli Peninsula. Gallipoli is famous to anyone who has heard of the First World War. The Allies in 1915 had been trying to get heavy warships through the Dardanelles to attack Istanbul, but had been thwarted by the Turkish mining of the channel, as well as by gunfire from the shore. Churchill conceived a landing on the Gallipoli Peninsula, to destroy the shore batteries, and to form the beachhead for a land attack on Istanbul. The core of the attacking forces were the Australia New Zealand Army Corps (ANZAC). The attempt was a devastating failure, and looking at the situation, one can hardly imagine how it could have succeeded. The troops were landed on a beach faced with an easily defended hillslope backed by rugged wooded country. 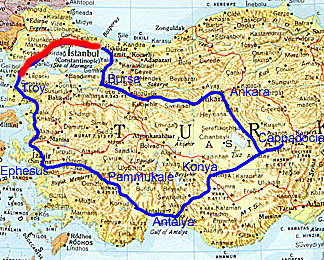 Even if the Allies had been able to dominate the high ground of the peninsula, it would not have been hard for the Turks to contain them in a trench warfare situation at the narrow neck of the peninsula, and the guns would still have been functioning on the Asian side of the Dardanelles. The Turks had a young officer called Mustafa Kemal, whose skill and bravery in the Gallipoli campaign helped them defeat the Allied invaders. He rose rapidly through the ranks, and after the war, commanded the Turks in beating back a Greek Army that was attempting to enforce a League of Nations mandate that awarded Anatolia to Greece--a major reversal, considering that Greece had long been a Turkish colony and had won its independence only a few decades previously. Mustafa Kemal became Kemal Ataturk, the first President of Republican Turkey. You can see his Mausoleum in Ankara. 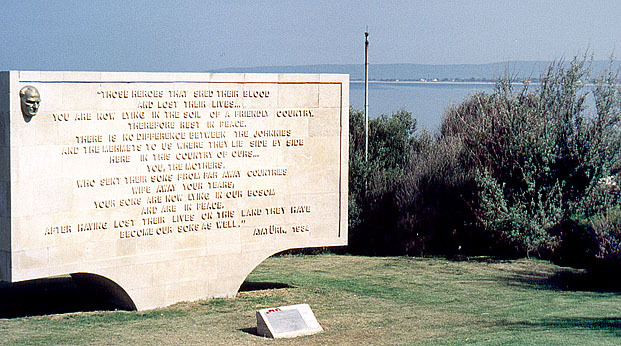 The memorial at Anzac cove, with the quotation from Kemal Ataturk shown at left. 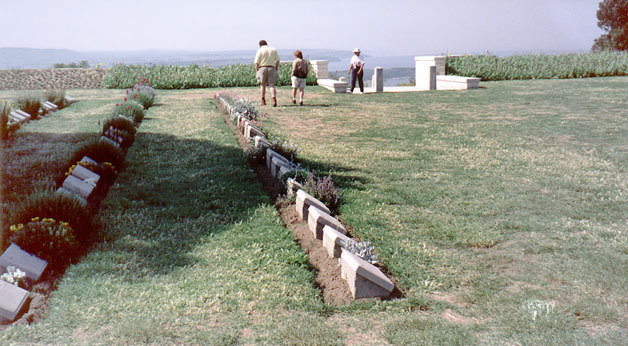 Lone Pine, an Australian cemetery on the hieghts of Gallipoli, looking eastward across the Sea of Marmara. Even today Gallipoli is a terrible place. It is hard to conceive how terrible it must have been in 1915 and 1916. There are so many cemeteries and memorials. One of the more uplifting memorials is a statue of a Turkish soldier carrying a wounded man. The man was an Australian, his life saved by the Turk, who later became Governor General of Australia. Anzac Cove looks to be a ludicrous choice for a seaborne attack. It is at the very end of the peninsula. A narrow beach and foreshore is faced by a steep hill up which any attack had to climb in the face of enemy fire. The only hope for an attack in such a place is total surprise, and there was none. The graves there are not only of Australian and New Zealand troops. Indians are there, too. There are not many, but on their graves it is noted that they were Muslim, and were buried in the religiously appropriate direction, different from the direction of all the other graves. One of our tour group had an uncle buried in the Lone Pine Australian cemetery on the heights. That area is no less disturbing. Somehow, the Allied forces managed to capture a respectable area of the heights of Gallipoli, but it is hard to imagine what they must have faced when they did. And what the Turks must have faced, too. The cemetery is now surrounded by woods and scrub brush. If you walk there, you find it is difficult terrain, because it is crisscrossed by trenches and pockmarked with shell craters, still, after 85 years. One hears about Flanders Fields, but the trench warfare into which the intended Gallipoli strike degenerated must have been every bit as bad, and for the Allied forces at least, they were much further from any base of medical support than were the Allied troops in Flanders. From Gallipoli we had a long and uneventful drive back to Istanbul along the north (European) shore of the Sea of Marmara. The towns slowly became more forested with the colour-striped apartment buildings, the road got wider, the traffic got more dense. 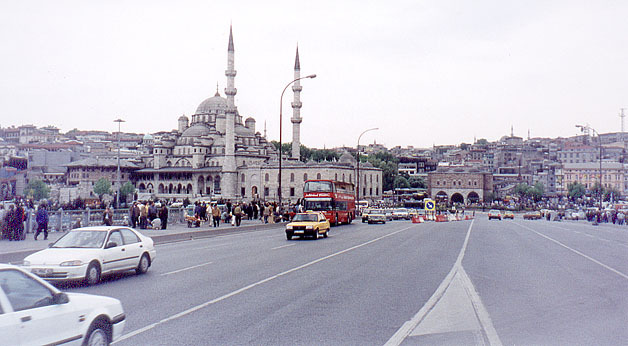 We arrived fairly far north in the city, crossing a high-level bridge over the very tip of the Golden Horn, before following the east side of the Golden Horn down to Taksim Square and our hotel, the same one we left ten days earlier. Bridge over the Golden Horn. Suleymanye Mosque in background. The Golden Horn and the Bosphorus from the end of the bridge. Two 17th century buildings of different styles. After we got settled in, we had a couple of hours to spare, so we and our Canadian friends from Winnipeg walked down to the Spice bazaar. 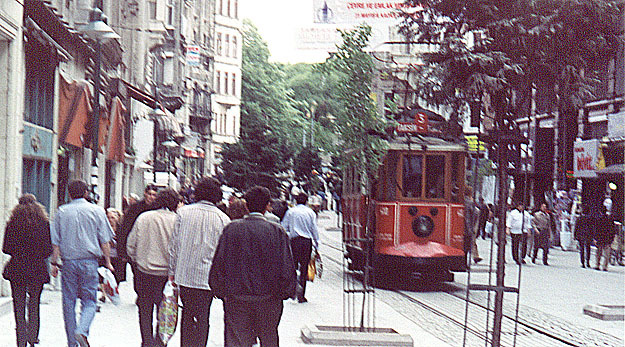 We walked along the pedestrian stree with the tramline down the middle--Istiklal Caddesi, past the embassies and the Galatasaray Tower, and down the steep hill to the bridge across the Golden Horn. At the end of the bridge is teh Spice Bazaar. 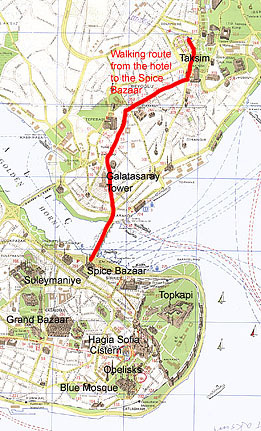 It is not a long walk, but it was very crowded, especially around the bazaar, and so it took us an hour to walk that distance. As I mentioned in connection with our first experience of Istanbul, there is a tendancy for all the shops selling one kind of thing to cluster together. 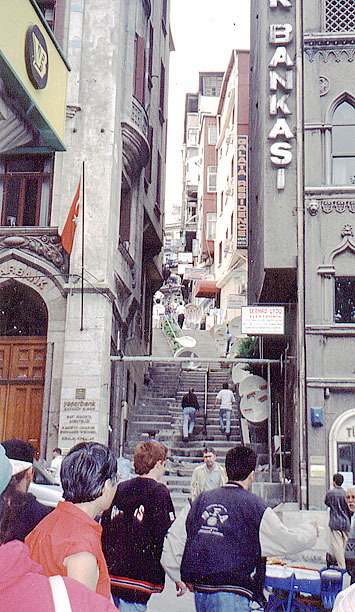 In our case, as we walkied down the little street from the Galatasary Tower to the bridge, we passed on the pedestrian steps at steepest part a strip where all the shops seemed to be selling high-power loudspeakers for mosque minarets. On our way back, we noted that the corresponding street next door, which we took on our return, sold just satellite dishes. 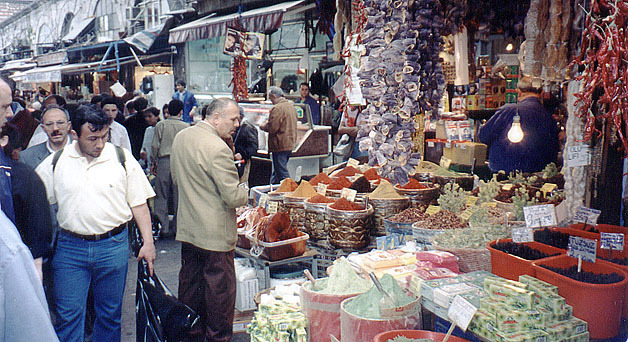 The Spice Bazaar. 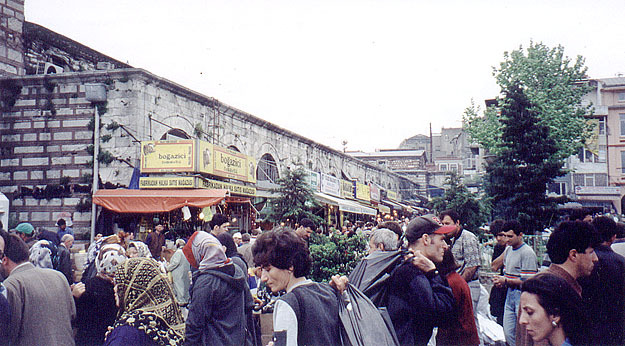 (Left) Crowds in front of the market building. (Middle) Some of the spices on sale in just one of the myriads of shops. 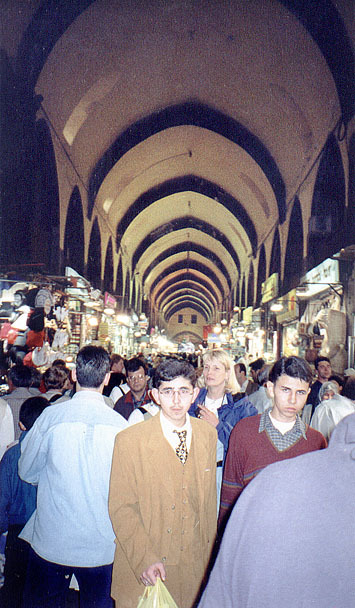 (Right) Inside the Spice Bazaar. It is L-shaped, and this is the east-west arm of the L.
When we returned, we just had time to change into some more suitable clothes and go to the farewell dinner, at which everyone gave Ahmet, Mr Orbay (our driver) and the Oguz driver's assistant their "tips." It was a convivial occasion, everyone having felt that it had been a very worthwhile and enjoyable tour,largely because of the skills and personalities of those three. Many of the tour group had to get up very early for their planes, but we and our Winnipeg friends had a flight after lunch to Toronto by way of Frankfurt, so we had some time to spare. The Cistern of Justinian. (Above) a postcard view. It was really much darker than this looks. (Right) The Gorgon Medusa as the base of one of the columns. Her head is also carved upside-down on another face of the base. We took a taxi to the Cistern of Justinian (or Yerebatan Sarayi), beside the Hagia Sofia, also built by Justinian in the 6th century AD. The cistern is an extraordinary place. 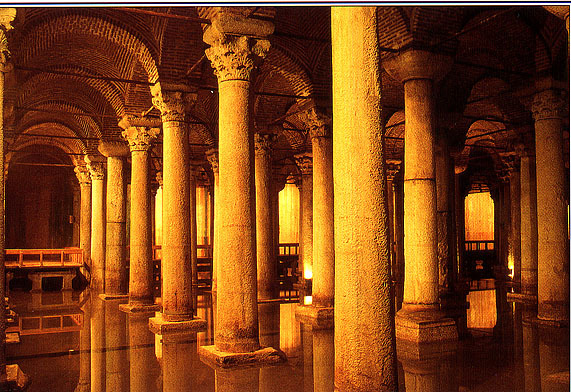 It was the central water reservoir for Constantinople. Now the water is only half a metre or so deep, with big carp or goldfish swimming in it, It is about 140m x 70m with the roof supported by a forest of columns something like 4m tall. Some of the columns were lit from the base by changing coloured lights, and the place was filled by quiet Dervish music, all of which gave a distinctly other-worldly feeling. 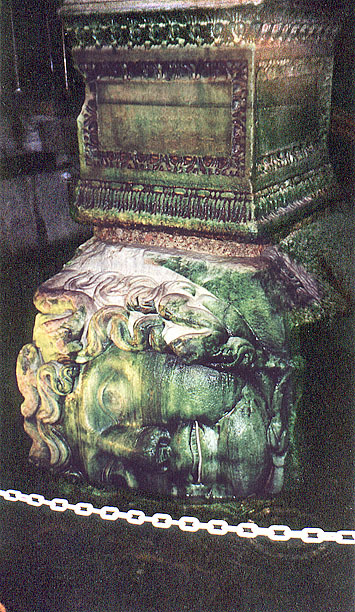 Although Justinian built the greast church as a Christian edifice, something of the older religions must have remained important, because one of the columns in the cistern had as its base sideways and upside-down faces of the Gorgon Medusa to ward off evil. A face of the Gorgon right-side up would have had exactly the opposite effect! 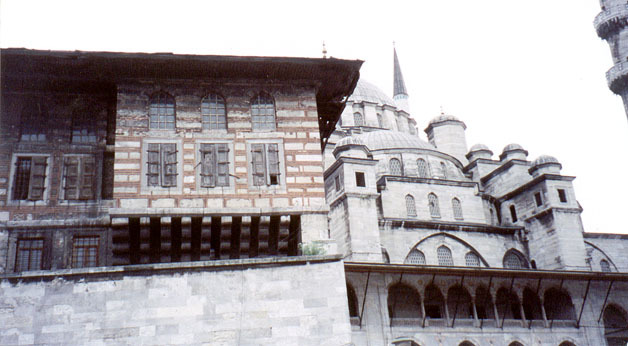 When we left the cistern, it was almost time for the Hagia Sofia to open. 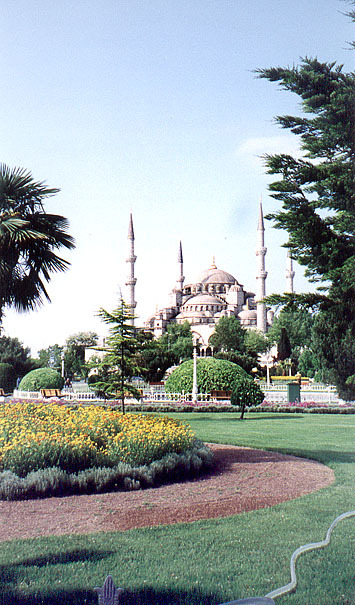 I wanted to see it again, but the others preferred to walk in the gradens between the Hagia Sofia and the Blue Mosque. Several tour bus groups converged on the entrance to the Hagia Sofia, but as a solo person I was able to get to the head of the line, behind one other man. Having paid the entry fee, we went straight inside, whereas the guides of the tour groups took their clients on a little tour of the Roman ruins outside, as Ahmet had done with us at the beginning of our tour. The allowed me and the other man to be alone in the enormous space, and in fact I was hardly aware of his presence. The atmosphere was incredibly spiritual, as much as anything I have ever experienced. I savoured the space by moving around the main floor, and then went up to the gallery to experience it from there. After a while, the first tour group came in. They were hushed, but the sound of their shuffling and a few whispers destroyed the spiritual atmosphere, and the place again became a wondrous piece of architecture. 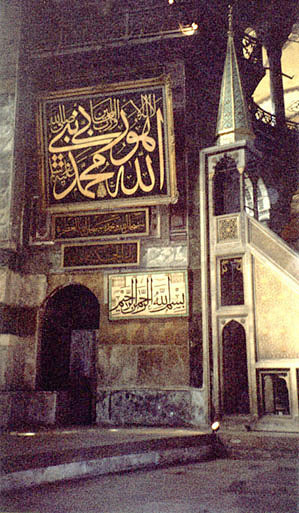 Inside Hagia Sofia. 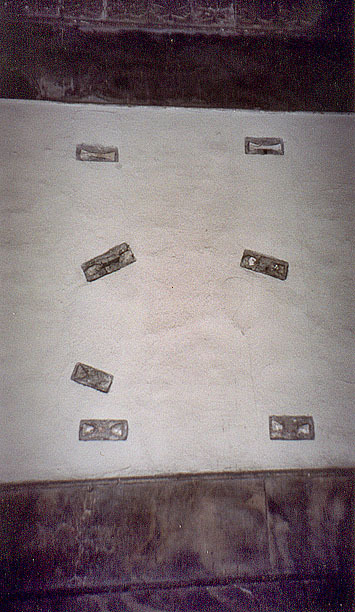 (Left) The "chair" from which the cleric used to lead the prayers. 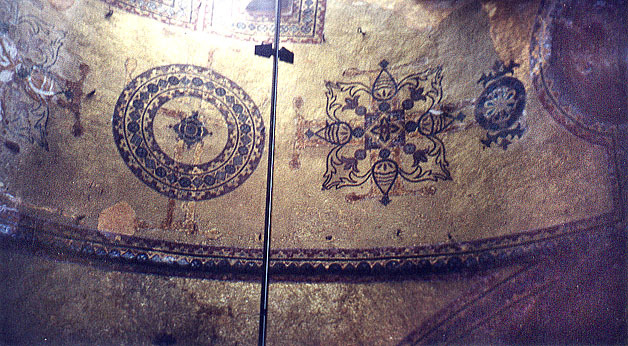 (Middle) Some of the mosaics in the dome. (Right) What are these? Mouse over the picture to find out. After regrouping, we took a taxi back to Taksim Square. The taxi driver was wild. He claimed to have a Web site "worldsbesttaxidriver.com" but that URL has never worked, and I have been unable to find anything like it using a search engine. The driver spent much of the time discussing his prowess with women. We asked if he was married, and his answer was "Yes, every night." And his driving was equally wild. He said he was going to be featured in a broadcast by the Australian Broadcasting Co later in the year. Since he started out of the Hagia Sofia area by what we knew was the long way round (he didn't at first know we knew) we got him to drop us as soon as we reached Taksim Square, rather than going on to the hotel. 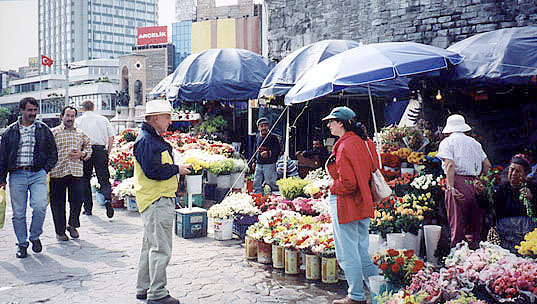 In Taksim Square, the flower sellers were out in force. We had arranged for transport from the hotel back to the airport as part of the tour package, and expected a minivan like the one that picked us up. But what we got was the big Globus bus, with Ahmet. They were going to the airport to pick up another tour group, so we had another chance to talk with Ahmet about some of the things we had seen, and to let him know how much we had enjoyed his guiding and the tour as a whole. The flight home was long and uneventful. After a month in the (mostly) warm Mediterranean climate, we returned to 10°C weather, which was a bit of a shock after what we had become used to, but it was cold even for the people who had never left home! Making this Web site has helped me relive one of the best and most interesting holidays I have ever had. I had never before contemplated taking a guided bus tour, but having done two of them, I now think it is a good way to get an impression, and perhaps a little understanding of a new country, especially one in which one does not speak the language. And if you are thinking of taking a guided bus tour, you could do much worse than look into whether Globus offers the tour you want. Many of our fellow tourists had been on more than one previous tour with Globus, and they all had only good things to say about the company and the guides (except for one story about an unfortunate young guide who was new, and way out of her depth--but that was a very exceptional case).